I took this photo last night at 8:03 p.m., Israel time (GMT+2). I hadn’t expected to get this shot because I was supposed to have my eyes checked by an ophthalmologist but he said my appointment was booked too late in the day for him to dilate my pupils. (Helloooo??? If not dilating pupils is an option, which is news to me, shouldn’t the receptionist have asked whether I was going to have my pupils dilated and scheduled me accordingly? Anyway, he was very nice about it and scheduled me for early tomorrow morning, so it wasn’t so bad. I got home with undilated pupils and was able to take this photo). The new moon is important for Jews because the Hebrew calendar is lunar and festivals are calculated according to the lunar cycle. 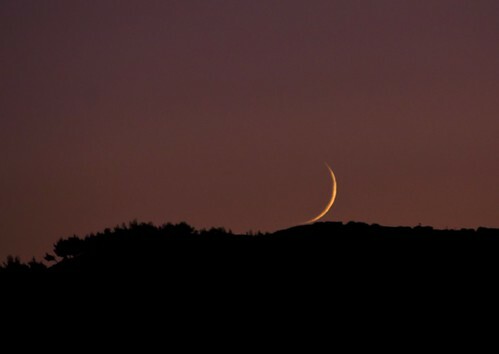 The new moon marks Rosh Chodesh, the beginning of the Hebrew month. Although calendar calculations are now done by computers, some people still observe the tradition of watching for the new moon. In ancient times witnesses (only men were eligible) traveled to Jerusalem to report the new moon sighting to the Sanhedrin (court comprising 71 judges; actually, the system was a bit more complicated). The witnesses were questioned to make sure that they had indeed seen the new moon and the announcement would be sent to Jewish communities in the diaspora (= outside Israel). Since I’m a woman I don’t contribute testimony but every now and then I send a photo to the Israel New Moon Society. This photo was taken just before the setting moon touched the horizon. I noted its appearance at 7:45 p.m., when it was much higher in the sky. Low moon photos can be difficult because the sky is quite dark but if the exposure is too long you get motion blur. Also, the moon (OK, I know it’s really the earth) moves surprisingly fast, which means that timing is important. When I used to have a really cheap tripod I missed a few “moon near horizon” shots because of camera shake caused by pressing the shutter button. I now have a cable release for the shutter, but my new Manfrotto tripod is sturdy and allows me to photograph in a strong wind on a top floor balcony with no shaking. I took the photo in RAW, ISO 400, f/7, 1/10 sec, 235mm. I cropped it and reduced the noise with Adobe Camera RAW. It’s not as good a shot as I’d hoped to get but I did learn a lot about how to approach this kind of shot in the future. This photo required a lot of post-processing, so I’m very glad I shot it in RAW. You can see the shadow of the earth on the moon. 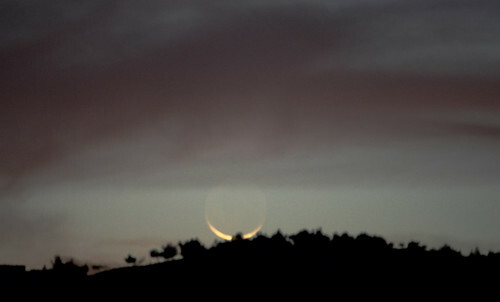 This was taken during a brief window when the new moon was visible just after it cleared the clouds above the horizon. 7:44 p.m., ISO 400, f/5.6, 2″, 250mm.